It is now 30 years since Brian Klelund established Tensid as a specialist supplier of the AGS© anti graffiti system, PROSOCO building cleaning products and Aquila pressure washing machines. This began a journey of innovation and Tensid UK is now Europe’s leading authority on the cleaning, restoration and protection of built surfaces. Tensid UK meets this need by providing a highly comprehensive range of products and equipment to manage the care of all common (and some uncommon) man-made surfaces and building materials. With over 30 years experience, the experts at Tensid UK can solve your surface care and restoration challenges. You can be assured of outstanding technical support and customer service. Plus, we strive to ensure that, as far as possible, our products are safe for the environment, biodegradable and friendly for the user. Tensid is the UK distributor of Aquila TD302REC hot water pressure washer. This advanced equipment collects, filters and recycles water for use again and again. What could be more environmentally responsible? Streets and town centres can be cleaned during the day as there is no water splashing and no need to fill up the water tank – use the same recycled water all day. Using the Aquila TD302REC hot water pressure washer means less time disposing of waste and producing waste notices. Saves water, time and energy! Yes you can! 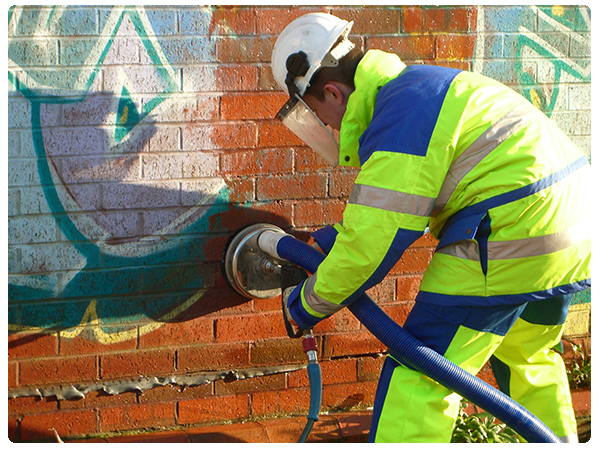 The introduction of Safety Klean has proven very successful and is being widely used by contractors, brick companies and precast concrete producers and it is hydrochloric acid free – it can be used on most surfaces and it does not damage surrounding areas, nor is it harmful to passers by. Slippery paths can be a serious problem and cause unnecessary accidents. Treat paths and many other surfaces such as brick, natural stone, wood and hard surfaces with Algo and see great results. Algae and other organic growth will disappear within a few days and prevent regrowth for up to 3 years. Algo is completely non hazardous for you and the environment – it does not harm animal, plant or aquatic life – so it can be used near water too – ponds, rivers, lakes or the sea. These were just a small selection, Tensid provides a fully comprehensive range of products that are designed to be kinder to the environment. And, continuing research and development means we not only improve but, continually introduce new breakthrough products to our ranges. We are not simply a supplier, our expertise enables us to provide technical advice and support for you on-site or by phone. We help you conduct site trials, provide demonstrations and AGS certificated training courses. Tensid is not a contractor, however we do have an extensive nationwide list of contractors whom we are happy to recommend. We are here for you – to understand your business and to provide the help and support to whatever extent you need. Working side by side with you – we supply the expertise, then you supply the success! Contact us today +44(0) 1932 564 133 or send a message here and we’ll respond fast.